Welcome back to our guide of Dinosaur Safari Adventure Golf, sorry to have kept you waiting! We always get asked the best way to play some of our holes, mainly by Adults looking to try and beat the kids at Adventure Golf, so we thought we would share some of our tips and tricks that might just help get that hole in one that you have been looking for! Hole Eight here at Dinosaur Safari Adventure Golf is quite literally the number 8. It is designed as a figure of 8. There are two paths down to the hole, left or right. It’s difficult to say which way is better. Right takes you over whereas choosing the left path takes you under. One thing to make sure is that you don’t put too much power in your shot to get to it to the hole, but also make sure you don’t hit the surrounding walls. If you hit the walls it will take all the momentum out of the ball and it will stop short, leaving your ball in an awkward area! Hit your ball too hard? Don’t worry it will run down to the bottom of the green and bounce back off of the rockbehind the hole and if you’re lucky it will go straight into the hole! Something that makes our 8th hole so special is that behind the tee off area we have one of our resident dinosaurs, peeking out from behind some of our plants. Don’t mess up your shot otherwise you’ll send him into hysterics. Before you play Hole 9 you MUST get a picture (or a selfie) with our fantastic megalosaurus, he may look scary but don’t worry he is chained up and he secretly loves all the attention! Hole nine at Dinosaur Safari Adventure Golf is a difficult, downhill green that has both left and right slopes! The best way to play this hole is to try and gently putt your ball up the first slope and the momentum will take the ball from right to left and back to right whilst it slows down for the hole at the end. If you’ve hit the ball a bit too hard don’t worry there are rocks that jut out on the way down to the hole that will take some of the impact of the ball. In terms of an exact route that will guarantee a hole in one, unfortunately there isn’t one. This is just one of those holes that are really difficult to play! 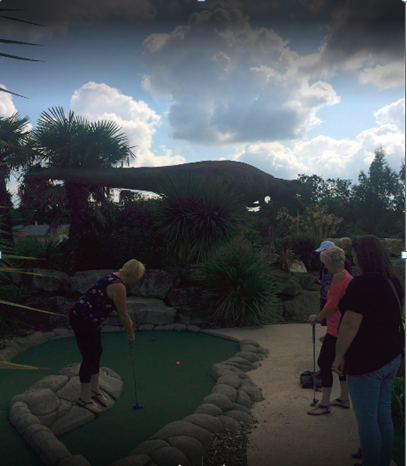 Hole ten here at Dinosaur Safari Adventure Golf gives you a choice, do you hit your ball into the water on your right hand side that goes under the skeleton? Or do you hit the ball straight down the green? Well if you’re unsure, rest assured all of us here at Dinosaur Safari will tell you to choose the water route! It gives you an amazing opportunity to get a hole in one as the ball comes out of the water at the bottom (right next to the hole). This is one of our special features so you should use it as our motto! If, however, you want to be a bit boring you can also hit the ball straight down the green next to the Dinosaur Skeleton, you need to hit it as close to the skeleton as possible, if not you could end up anywhere on the green. If you do go down the water and the ball doesn’t come out for any reason, just shout for one of our team and we will sort you out with a replacement ball as fast as possible.